“The Martians are coming to Cookie! Will they vaporize it? Or just take a bite out of it, and leave? Find out Friday night at Avatar Repertory Theater!”@5PM SLT, Friday 1st November. 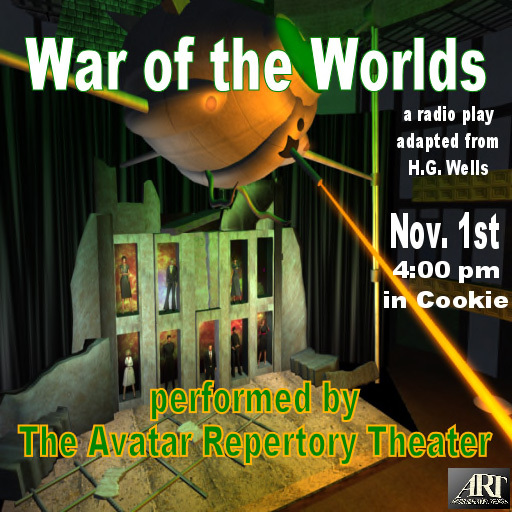 Avatar Repertory Theater will present this adaptaion of “War of the Worlds” Friday, November 1st in a single performance, live from their theater on Cookie in Second Life (c) by special permission from the Estate of Howard Koch, primary writer of the 1938 radio script. The performance features Kayden Oconnell, Corwyn Allen, MadameThespian Underhill, Ada Radius, Avajean Westland, Sodovan Torak, Em Jannings, Thundergass Menges, with Caledonia Skytower producing. The presentation will include dynamic effects, so residents are asked to minimize wearable scripted items, excessively primmy clothes/hair, and to take off huds and meters to provide a more enjoyable experience for the entire audience. Don’t make us send the Martians after you! Next Post: Something spooky comes your way in the Halloween edition of Designing Worlds!